On the eve of Kevin Melancon’s 45th birthday, he received one of the biggest surprises of his life. He was named Man of the Year by the local Leukemia & Lymphoma Society chapter. “It was actually the first time I’ve seen him break down emotionally,” said Lonny Melancon, of his son who was born with Down syndrome. Being named Man of the Year was an honor Kevin Melancon never dreamed of and one that started gaining momentum months before. That’s when Melancon was given a $5 tip by Mike Placek, a regular customer at the Lafayette, La., Chick-fil-A restaurant where Melancon has worked for 19 years. It’s what Melancon did with the tip would that would start a movement in the local community and on social media. 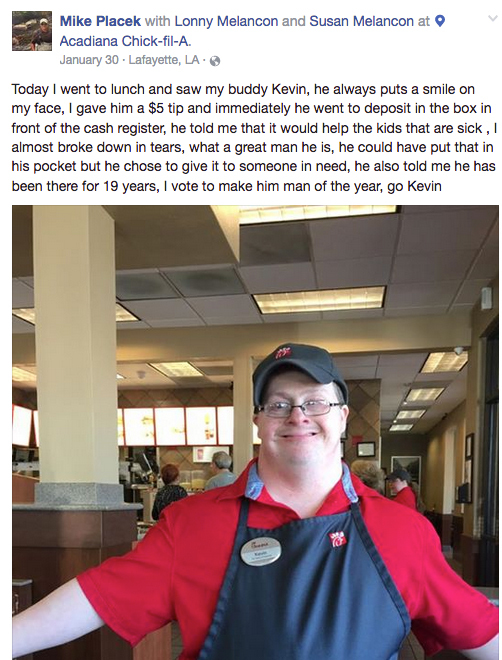 Placek took to Facebook to share the inspiring story, posting, “What a great man he is...I vote to make him man of the year.” The post quickly topped five thousand likes, including one by Paul Durand and another by Jim Doré. Durand, president of a local bank, and Doré, a local businessman and former Man of the Year himself, were both moved by Melancon’s generosity. Durand nominated Melancon for Man of the Year, one of the top honors in the community, and both men pledged fundraising support. In order to be considered for Man of the Year, Melancon would have to raise donations for the Leukemia and Lymphoma Society. They founded “Team Kevin” and raised $81,563 for the Society – the most of all nominees, earning Melancon the “Man of the Year” title and contributing more than a quarter of the $300,000 total grant money raised by the entire Lafayette Campaign of the Mississippi and Louisiana Chapter. They money will help the Society’s mission to cure blood cancers. At the awards ceremony, Melancon named the grant in honor of his aunt, Mary Romero, who lost her fight to cancer several years ago.